Worried about how many calories you’re consuming? Are you regretting that you ate too much? Perhaps, you are worried about what you can eat at a restaurant? 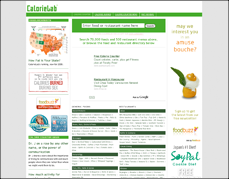 You can find out how many calories you just obtained on this site “CalorieLab”. This site has huge data base of food and covers many foods that you would find on a restaurants menu. You can also find out how many calories you can burn from specific activities. This entry was posted on Monday, February 7th, 2011 at 4:05 amand is filed under . You can follow any responses to this entry through the RSS 2.0 feed. You can leave a response, or trackback from your own site.